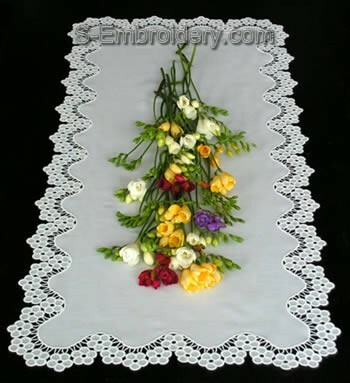 Another fine addition to our collection of free standing lace decorated table runners / table tops. 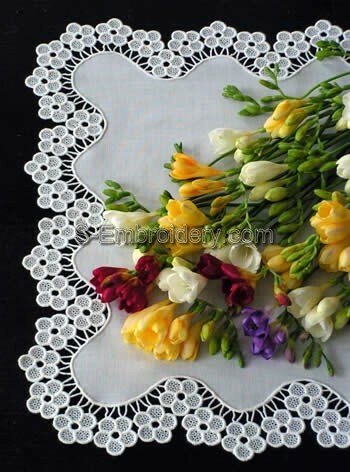 This set includes 2 freestanding lace machine embroidery designs. Each of them is available in 2 sizes. Using these designs you can create a square or rectangular table runner with a size of your choice. The table runner featured on our site measures 40.9 x 17.7 inches (104 x 45 cm). 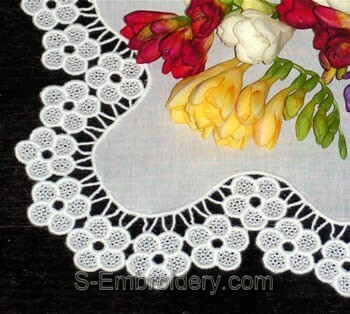 Note: Detailed images of the designs and the table runner are available further down this page. The designs will fit in 5x7 (130 x 180 mm) hoops or larger. You receive 4 embroidery files as well as embroidery design information and instructions in PDF format. there are very nice designs ! !